The magazine Game Informer has revealed more info about the new engine that is being used for The Elder Scrolls V: Skyrim; first off, it’s being called the Creation engine. The graphic details doesn’t end there, of course. The game features an advanced foliage system that allows level designers to get as detailed as the weight of each tree branch, while also making more use of ambient light to create believable shadows and lighting. Since Skyrim is in a cold region, the weather effects are being revamped and improved to get realistic snowfall and blizzards. If that weren’t enough, fresh snowfall will accumulate realistically on rocks and trees. Graphics aren’t the only important part of the engine, of course. Oblivion’s “Radiant” technology will be upgraded and improved to revamp NPC behavior. In Oblivion, while townsfolk had some sort of routine, they were only given 5 or 6 tasks to do per day, and otherwise wandered around almost aimlessly in their predetermined locations. Now, they’ll have more environment to interact with realistically. For example, if they’re supposed to work in a woodmill, they’ll be chopping trees down, splitting logs, taking them to the mill, and so on. The AI will also react to a player’s actions more realistically as well, and depend on the relationship with that NPC. A friendly NPC won’t be upset if you enter their house in the middle of the night, while a stranger or a hostile NPC will be outraged. Adding to the realism will be the inclusion of the Havok’s new skeletal animation tool which allows PCs and NPCs to react realistically if they’re trudging through deep snow, or caught in a spider web, or transitioning from walking to jogging to running. It’ll also capture realistic animal animation, such as bears and… dragons. Another exciting element to the game will be the inclusion of randomly generated quests with a new engine Bethesda calls the “Radiant Story” engine. While there will still be scripted quests and sidequests in the game, the game will be able to invent a few on the fly, and still relate it to the main story. The Radiant Story system can also keep a player from losing sidequests if he kills a character who would have given him the quests. For example, if a player kills a shopkeeper, his sister may take over the shop and issue those quests. The Radiant Story system will also take several factors into account when assigning quests, such as dynamically changing dungeons a quest is located in if the player has already cleaned out that dungeon. Friendships and grudges may generate missions – smaller quests may lead to larger ones, and befriend an NPC well enough, and they might be your sidekick for some missions. The system will also have some odd procedurally generated encounters – if you drop a vital item in the middle of town, someone may return it to you – or two people may fight over it. Experts at a skill may have NPCs asking them for training. 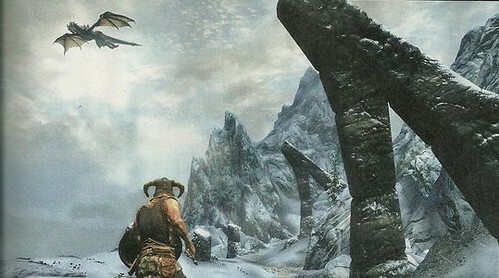 The Elder Scrolls V: Skyrim is starting to sound more and more amazing. Let us know what you think.